It's been a long and busy week, but the weekend weather has cooled off and it really pleasant outside. I'm going to try and keep working on my minibike project and hopefully post a few photos of the progress. Last Sunday/Monday, I made a couple trips to TSC to get a raincheck on some roller bearings for the wheels I have. The old ones were either gummed up or rusted out. Hopefully they'll call me back soon so I can get them tapped into place. I did a little light sanding on the frame on Monday to knock off some of the rust and see if there were any cracked welds. So far it appears in good shape. I plan to see if I can locate a used engine for the time being, either off an old tiller or some other piece of old yard equipment with a horizontal shaft. There's a few places in my neck of the woods where I think that I could find one. If you ask everyone you know or run into that you need a lawnmower type engine one will turn up! Post those pics. So I got home tonight. I measured the maximum space in which the engine could fit, between the mounting plate and the top bar. This was about 12.5". And then I measured my engine. Without the fuel tank on the side, it measured 15.5". Finally got a chance to work on my minibike project for a bit, and finally got some pics on what I have done with it so far. It's got a ways to go, but here are some pics! All the sanding/cleaning was done by hand, so it's far from perfect, but it was much better than it started out. I have one new tire for the rear and decided to reuse the previous rear tire as a front tire. The previous front tire was practically stuck to the wheel hub and so I wound up taking a knife to it and then gently chiseling out the rest of it as the tire was sort of melded to the hub. A scotch-brite pad and some hot soapy water go a long way! The sprocket is a 60 tooth, the bracket that mounts the sprocket to the wheel rim needs some primer and some paint eventually. The bearings were pretty much either rusted or frozen in place, so I had ordered some from the local Tractor Supply store, and they finally came in a few days ago. I was able to tap out the old bearings and then tap in these new ones. I had cleaned/lightly sanded out the areas where the bearings sat, but in one case, this widened that area, so one of the new bearings was a bit loose. So I wound up putting a little bit of the gasket sealant in that area and then resting some weight on the bearing once it was in place to provide a tight fit. Hope it stays in place! More pics soon hopefully. I want to get the frame cleaned up some more. I had sanded off most of the rust, but wound up putting it back behind the shed for a couple weeks, and it decided to rain... It's been cold lately, so I am hoping for a moderately warm day and some free time so I can put a basic coat of primer on it to prevent more rust from occurring, should I not be able to finish this before winter sets in. As for the engine, I now have an oil plug cap, and I am waiting on a filter to arrive. Then the decision will be to either sell the engine, or modify the frame. Whew! Sorry if I got long winded! Brake, wheels and sprocket cleaned up nice. I bought some locktite stuff at the auto parts for a loose bearing fit. I replaced an idler pulley bearing like we use, on my old Dodge truck. I could push in the bearing with my fingers and it would wobble a bit in the hole going in. If you need the name of it, I will dig around and see if I can find it. Good stuff. DZLBIKE- Yeah, I think I will plan to try and find a 5hp Briggs. When I first saw this one, it reminded me of the engine on our Troy-bilt tiller, something solid and reliable. But it's a bit much for my needs. When the air filter I ordered comes in, I'll make sure to get it running smoothly and see if I can turn it around for profit, hopefully enough to buy a 5hp Briggs. I knew the shaft would be a problem when I saw it, as it's threaded and there is no keyway. The gear on the end of the shaft is just sitting there, not even bolted on! It came with the engine. (Fell off when the guy tried to start it to show me it ran, haha). TomH- Thanks! Spent a few nights in the garage with hot, soapy water and some scotchbrite pads/light sandpapering. I decided early on that if I was going to attempt this, I wanted to at least make sure the parts were clean. Didn't realize that the part that held on the gear was a brake? When I got it, it has a scrub brake. So I could use that as part of a drum brake? Awesome! I think I would have to do some more sanding though, it's still a bit rough. So far so good with the gasket sealer I used. Not to be irrelevant, but I have a set of 6" Rupp Turbine wheels and tires. I'm cleaning them up now (to the best of my ability), and don't think they'd fit my minibike (scrub brake is too close). I'll post some pics of them later. @TomH- I thought about it and think I'll keep the 3-spoke wheels. :smile: They have a certain appeal to them, plus I just replaced all the bearings on them. But I'm gonna finish cleaning up the Turbine wheels and see where that goes, (so far, much more time-consuming than the 3-spoke wheels, so I might just do the basics). I'd like to keep as much of the original hardware as I can (there's something novel to me when the bolts say "Rockford" stamped into the heads), so I will probably clean up those bolts, as they're not that rusty, in my opinion. Had a chat with my dad last night, who talked me out of using a grinder when sanding the old paint/rust off the frame. I figured it would work well, but he thinks it'd gum up the discs quickly and take off too much metal. I have some wire brushes that came with a tool chest I repaired/painted, and wondered if I used them with a drill, if they'd do a good job removing the paint/rust, and not scrape the heck out of the metal? I figure if I go lightly/gently, it'll be fine. It's 2:20 in the morning here and I gotta be up at 5:30 to get ready for work. Time to crash. Peace. This Hound Dog belongs to a friend of mine. 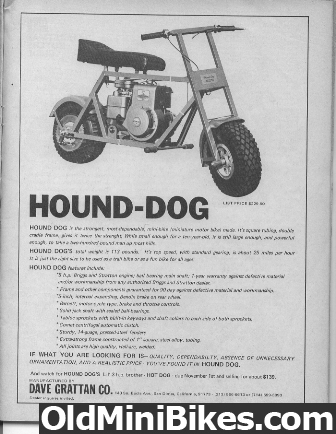 I saw from that ad for the Hound Dog that there was a smaller version, called the "Hot Dog". I haven't seen a pic of one yet and wondered what it looks like in comparison to a Hound Dog? dad is smart, do not grind, even sanding leaves marks and gouges if not done correctly. I wound up using some wire wheels and an old Montgomery Ward drill that my dad loaned me. I haven't finished cleaning up the frame yet, as it got cold, dark and windy pretty fast tonight, but I hope to finish that by the end of the weekend. I also did a little cleaning up of the other Rupp wheel. I took a few pics and I'll post those soon. Yeah you can clean them up and sell them to help finance the project or keep em. They will always be in demand. good deal on the wire brushes. If they do make swirl marks, use them to your advantage. for your finish strokes, go around the wheel rim lightly and get them to run parallel instead of helter skelter. It will look more machine finished that way.